Fall in love with the Augustina. 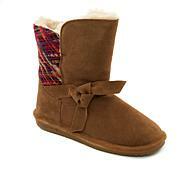 As cute as a puppy, this irresistible boot beckons with its adorable design and inviting interior. No potty training required. These are so cute and different! I have the pink ones and the blue. I love the fur on top. They do run big. I ordered an 8 and even with a heavy sock on they were big. So I exchanged them for 7s. They fit really nice in the width and length. You will get compliments. These are the most comfortable boots ever. Tends to run larger which I didnt know when I ordered them 1 size larger. Still, Love, love love them. 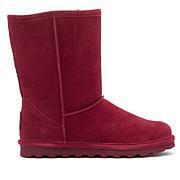 This was my 1st pair of Bearpaw boots. I ordered the black and ordered a size down like the presenter suggested. They fit perfectly and they are the best boots I've ever owned. I actually ordered another style a few days later. Haven't had a great pair of boots in over 40 years. I bought 2 pairs for my mom because she's so spoiled lol. She tried on both colors one being the Augustina and wore 1 pair outside to walk our puppy and she just love's them. 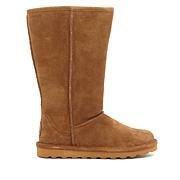 Thanks bearpaw and hsn. These boots are so adorable....love the look of the tassels. I ordered in the blush which will go well with lots of colors. I take an 8-1/2 shoe and usually go up to a 9, but I took the advice offered on air and ordered an 8. Perfect fit even with socks. They are a generous size.